Well, it's almost 80 degrees today and I've been working on some Gift Giving ideas for Christmas. While flipping through the Kohls ad that came yesterday in the mail, it reminded me I had some glass coasters in my "alterable stash". I got them out and went to work creating my gift. 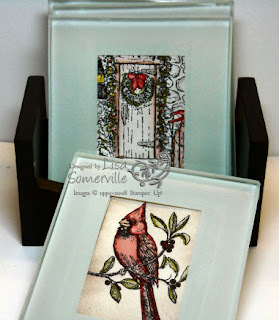 The images - A Cardinal Christmas and Home for Christmas come from Stampin' Up! 's Holiday Mini Catalog. I stamped them in black and colored them using the Marker Water Coloring Technique from a past issue of the TJNL. If you'd like to order these stamps or other products - just click here to order from my Website, or send me an email - I'd love to help you with your order. All orders of $150 or more do qualify for hostess benefits! Just beautiful Lisa! Some lucky person will get a great gift! Gorgeous Lisa! Love the blue (aqua) color of the glass. Oh my, these are just FABULOUS!!!! You've represented this stamp set SO well!!! Those are very beautiful. I would love to try something like that, do you know where one might find those glass coasters? Thanks for sharing. Ohh la la! these are fantastic!